Time to ‘fess up! You have probably had your share of daydreams about escaping your daily routine. Even after relocating successfully, you’ll sooner or later reach the point when a strange country starts feeling like home: a cozy feeling, but a little stifling, too. While most of us leave the big adventure to our daydreams, some are lucky enough to live it. InterNations member Mahsa, an expat from Iran, is among those happy few. Follow her on her trip of a lifetime as a solo female biker through Ethopia, the Middle East, and Central Asia. Mahsa wasn’t born to be an adventurer: she lived in her native Tehran till the age of 17, when she moved to Germany for the following eight years. She did a lot of travelling and moving in her twenties, “hopping from one country to another”, as she describes it, until she came to Spain in 2003. Despite her love of travel, organizing an international motorcycle trip wasn’t remotely on her agenda. After relocating within Spain, from Seville to Madrid, she became an early InterNations member in 2008. Today, it’s not networking in Madrid that’s on her mind. It’s learning how to say “Could you please help me lift my bike?” in Russian and sorting out a transit visa for Turkmenistan. How did finding that niche happen? Laughingly, Mahsa admits she didn’t know much about motorbikes until a few years ago. She was even a bit afraid of them – of the speed, the risk of traffic accidents. But a woman with a Vespa inspired her to start small. Then, during a trip with friends to Southeast Asia, she decided to give riding a motorbike a try – and she loved the new-found mobility and independence. “It adds that sense of adventure,” she says. You are dependent on your environment; you need to rise to a challenge from one moment to the next; you have to be self-reliant and make your own decisions. She didn’t want to miss that for the world. Back in Spain, Mahsa got her Spanish driver’s license for motorcycles and ended up buying her first bike – a “really big one”, she remembers, though she soon traded it in for a smaller and lighter model. A few months after passing her driving test, she was off on a road trip to West Africa – still in the company of friends. It was very exciting, but she recalls that her lack of experience also made it potentially dangerous. “I learned a great deal,” she says. Enough to strike out on her own. 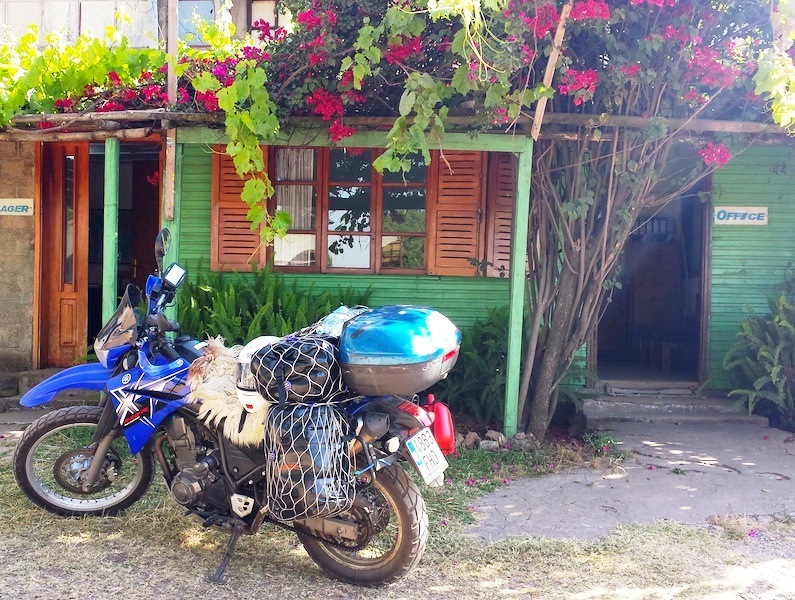 For the last two and a half years, Mahsa has been setting out for motorcycle trips on different continents whenever possible. Her latest journey started in Spain last November. She had her bike shipped to Ethopia, where she wanted to visit a friend and take several months to explore an unfamiliar country. She was entranced by Ethiopian history and culture, customs and traditions, and the overwhelming scenery. Her lack of language proficiency almost proved a serious drawback, though. 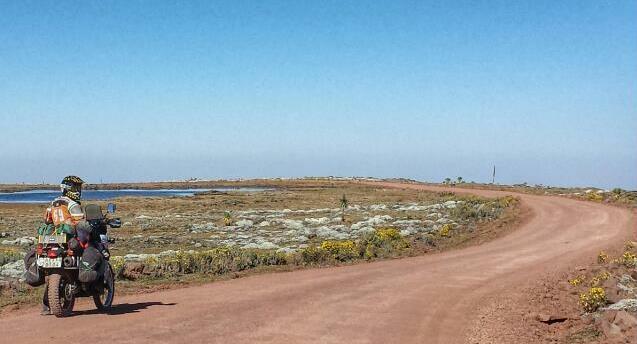 When she took a fall in a remote area, she couldn’t lift the bike anymore. 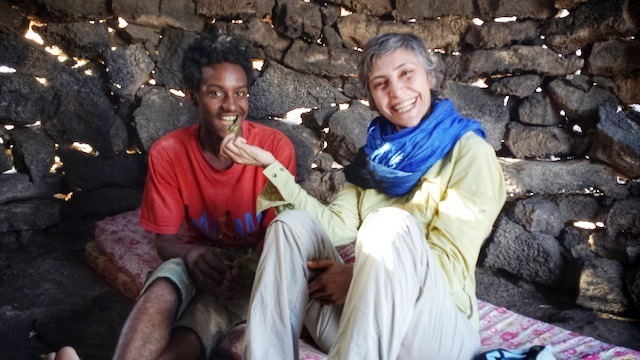 After walking for a while, she stumbled upon a family farm – only to realize she couldn’t explain herself in Amharic. “I felt a bit like an alien,” she sums up the situation self-deprecatingly, “and also very stupid.” Now she makes sure to know some essential phrases and “lots of motorcycle words” in the local language, or a suitable lingua franca. After Ethopia, the next part of her route proved more difficult: Yemen was closed to her, as the country is being torn apart by a civil war, and her detour through the Saudi Arabian desert was barred due to visa restrictions for solo female travelers. Eventually, she had the bike shipped again (“I could write a Ph.D. thesis on shipping regulations”, she jokes), this time to Oman. The rest – through Oman via the UAE through Iran – was easy, Mahsa says blithely. She’s taking a break to shop for spare parts and study some Russian for the last stops on her itinerary. By September, she wants to have crossed Uzbekistan, Turkmenistan, Tajikistan, and Kyrgyzstan. When reaching the Kyrgyz-Chinese border, Mahsa will have to decide anew. Bringing your motorcycle into China seems to be rather complicated, so she doesn’t know yet where she’ll go next. Mahsa’s a slow traveler, too, preferring to live in the moment. “It’s not possible to have everything under control – actually, you shouldn’t.” It’s those unexpected moments that make the experience worthwhile. “People always ask, ‘Isn’t it dangerous?’” she says. “I just reply, ‘no, it is amazing.’” She’s met plenty of friendly folks along the way, and she loves couchsurfing to get an impression of local life beyond the touristy clichés of her various destinations. Her own sense of a fixed home has long been lost through travelling. “Any place could be home now,” she says. The borders of her personal existence have expanded much and more, to become virtually meaningless. I’m sure this applies to wayfaring motorcyclists just as well. If you would like to follow Mahsa’s journey, you can see pictures and read more stories from the road on her blog. 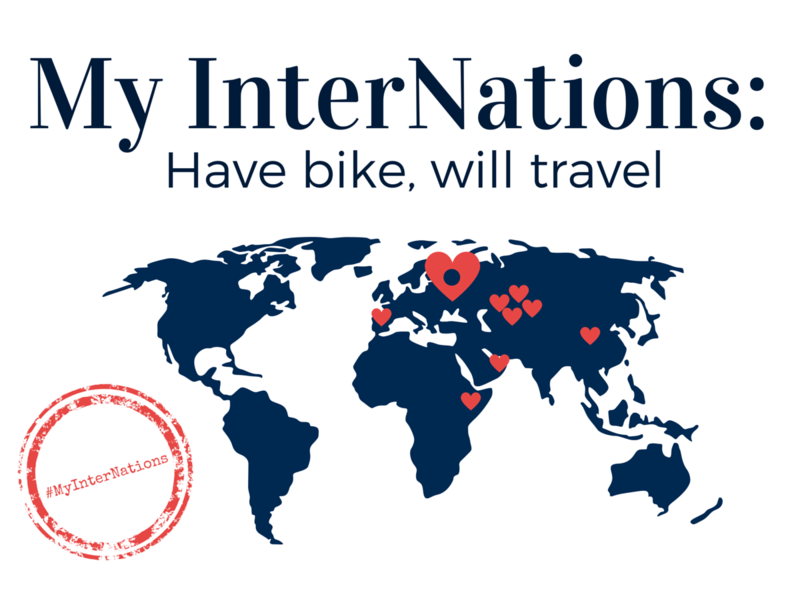 Image credit: 1) InterNations 2)-5) Mahsa H.
Really feeling great to read about your solo travel with motorbike. If possible you must travel …… Manali- Leh- Laddakh. ( India)..distance with bike; I’m sure that will be your life time experience. I do have a big HD bike. If you ever had a chance to visit New Jersey, USA — please let me know. Love to ride with you. Anyone else in NJ — you’re also welcome, be in touch with me. I love to ride along. Let me know. Looking for other riders for group riding. What an inspiration! I love this story and can’t wait to follow Mahsa’s blog. Haleh Chetori Mahsa ! Congratulations at ur decision ! I believe you should be a fantastic inice person ! on motorcycle ! Keep smelling the roses and taking ur time ! I am extremely happy to know your feat. I can understand the fun and challenges as I have travelled around the world with bicycle. Wish to meet you if you happen to be here in greater Vancouver BC., region. Hi Girl, what model of bike are you using for that trip? Good for you. So lets motor trek in South America. I am heading down there to retire (in Ecuador). I have a few bike friends in Ecuador. We are planning our next trip to Peru and Colombia for now. PS: then to Nepa……….. care to join us? Id love to join for a ride if ever come across cancun or the area!! You sound lake a carbon copy of my life. I spent 20 years in the military traveling the USA and the world much of it hitchhiking. I have Transgressed the U.S.. twice using only my wits and my thumb. I have traveled extensively on my motorcycle including Scotland where I bought one of my first motorcycles. In 1990 I drove my car from Florida to Honduras to meet a future wife. I didn’t speak a word of Spanish but the trip was made successfully. I have since made that trip no less than five times in a car. I am now married and living in Honduras with my wife and family. I just celebrated my 75th birthday and no longer have the desire or inclination to travel. I wish you well in your journeys as it has became a dangerous pastime since the days I did it. You have more courage than I and I thought I was the brave one with my care free attitude of trusting everyone. May you continue your adventure’s successfully. You will carry the cherished memories with you for the rest of your life. I wouldn’t trade mine for anything. That is SO great! I love seeing people shrugging fears and going out to meet other nationalities face to face so that they can find that we are usually more similar than we are different! Let’s all turn off our TVs and their ideas and instead go out and live a wonderful life of loving other people and peoples. If you are in beijing i would love to meet you. 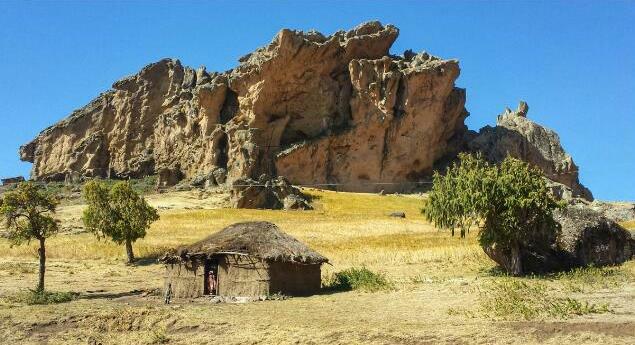 Ethiopia is a great country and such a unimaginable history. Russia would be as awesome. I will join you with my bike. That’s quite interesting hope she comes to Uganda too! I will be glad to meet her.